There’s an old saying that ‘A journey of a thousand miles begins with a single step’. A very apt saying when discussing hiking and one that has come to signify more generally that the start of any endeavor, any journey, is often the hardest part. In my case my journey towards becoming an ultralight hiker started about two years ago, is still very much a work in progress, and one that I’d like to share with you. For keen hikers who frequent the internet or read the various outdoor magazines the concept of ultralight hiking is probable one that they are familiar with or at the very least heard of briefly. 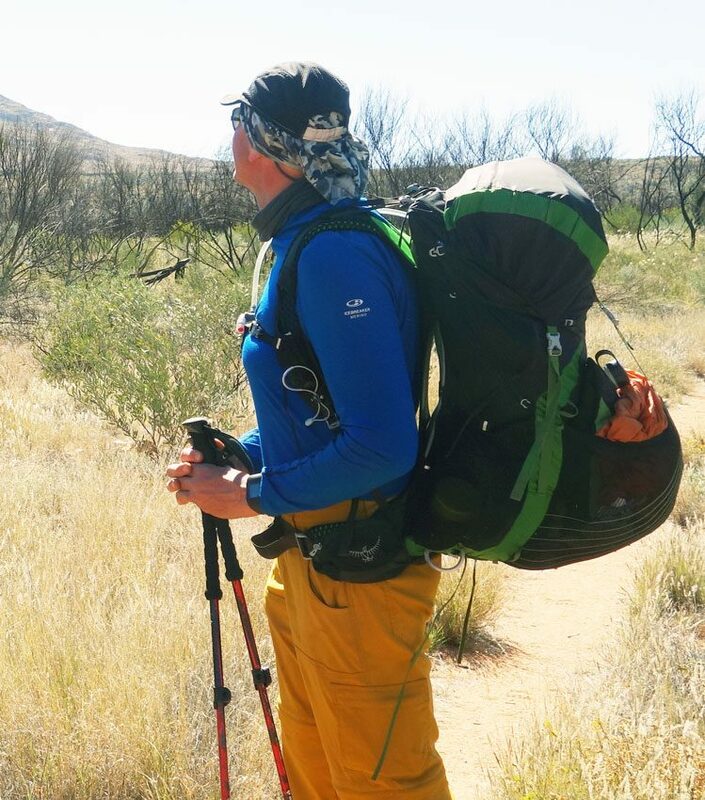 The concept originated over 20 years ago on the US long trails and is steadily gaining traction as hikers aim to minimise the weight they carry. But just what does it mean to be an ‘ultralight’ hiker? Conventional wisdom is that lightweight backpacking is when your base weight is less than 9 kg (20 pounds) with base weight defined as the total weight of your entire gear kit, excluding consumables (food, water and fuel) that you are carrying. An ultra-light backpacker is someone who carries a base weight of less than 4.5 kg (10 pounds). The idea being that by the careful trip planning and meticulous gear consideration you can minimise the weight that you carry and by doing so reduce the impact on your body. This weight reduction has the potential, if you so choose, to increase the daily distances you can achieve, particularly on the long hikes, by either increasing your hiking speed and/or allowing you to hike for longer. I can clearly remember the trip that was my catalyst to become an ultra light hiker; a 51km (32mile), three day, two night trail in a local wilderness area. The trail had minimal signage, steep inclines and declines, and being midsummer the word hot didn’t do justice to the weather we were experiencing. In addition, there was some concern about water availability due to the drought that was affecting the eastern seaboard at the time so we were carrying 2 days of water just in case. So armed with our 19.5kg (42lbs) packs we headed off. Now I say that I remember this trip well and this wasn’t just about the scenery but to a large part about pack weight. It was this trip that had me question why this gear needed to be so heavy and what I could do about it. So began my journey towards becoming an ultralight hiker. Decide if you really need a piece of gear or do you just want it. Either answer is fine but remember you have to carry it. Now I must admit that while I agree with most of these key concepts there are some that don’t particularly follow and I’ll explain why. The big three (tent, sleep system and pack) are the obvious starting point. Why carry heavy gear if you have a lighter option that will meet your needs? Care needs to be taken to ensure that what you are carrying is going to allow a safe enjoyable hike so this will likely mean different gear from hike to hike depending on the weather. The drawback here is that this may mean that you will need a variety of gear to meet your needs. A good example is sleeping bag selection. The difference between a lightweight four season bag and a lightweight three season bag can be 500+ grams (18 ounces) or more. If you translate this difference across your entire gear selection then you can see where the weight adds up. The problem is lightweight gear costs more money and everyone of us has a budget to work with. In addition if you can only afford to have a limited range of gear you are going to have to make compromises somewhere. Carrying only items that you will use seems really logical but not always easy with the first aid kit being a good example. I rarely if ever use my first aid kit but there is no way that I would not carry it, as minimal as it is. Similarly I carry the appropriate layering system for the weather conditions that I expect on a trip, which is often difficult when you expect a wide temperature range. I could gamble and not cater for sub zero temperatures on a number of hikes that I do however if I am wrong the consequences could be serious, even lethal. Modifying your gear by cutting straps or removing additional compartments is one concept of ultra light hiking that I don’t agree with (most of the time). While you may not need particular straps, or the pack brain, on a particular trip you may need it at another time, say when you are wearing a number of extra layers and need that extra strap length. It may be that you have a number of different packs and dedicate a specific pack to a particular trip type however for most of us this is a luxury that we don’t have. If the gear is the correct size then you shouldn’t have to do to much modification. Pack then repack is something that I have always done on any trip, overseas or otherwise. It’s amazing how often things ‘sneak’ into your pack. Regardless of whether I am doing a hiking trip or otherwise I will do a full pack five 5-7 days before I leave. I will then unpack the lot and review what I have packed. I will usually do one initial pack and two repacks and it’s amazing what I strip out each time. The difficult thing to judge here for longer trips is the food requirement but the more I consider this the better I am getting. Make your own stuff is also another concept that doesn’t sit well with me. I must admit that this is a personal choice, as I tend to look at this from a cost benefit analysis. If you consider your hourly rate of take home pay versus the time it will take you to make a piece of gear, more often than not it isnt worth the effort. In addition what else could I be doing if I wasn’t making gear? Nowadays there are a large number of gear manufacturers, mainstream and cottage, that will have gear that meets your requirements. The quality is likely to be much higher unless you are very good at craft. Having said this if you enjoy the process of making your own gear then go for it. Just remember to keep track of the costs. Need versus want is often the hard one with going ultralight. You need a decent layering system that will suit your hiking requirements but do you really need a spare set of clothing. Apart from socks and underwear where I carry two pairs I usually hike with one pair of pants, one lightweight top, one heavyweight top, one lightweight down jacket, lightweight thermal long johns and rain gear. This combination will comfortably cover me down to temperatures around -7 (19°F), and for me that’s just standing still. Once I move I heat up and strip down. This means that I will smell on a long trip but I would rather that than the additional weight. You however might choose to smell less on a hike and carry additional sets of clothing (and additional weight). Again either option is fine; it’s your choice. Document and weighting your gear is where you can really start to see the difference. The term ‘gram weeny’ is often one used for ultralight hikers in the process of reducing weight. While the initial weight reduction is likely to be significant the longer you persevere with the process the smaller and smaller the weight reductions will be. Cataloguing your gear, will force you to consider closely each item and see where potential savings can be made. As part of this documentation work out what each piece of gear will do and what each combination will cover. This documentation process is particularly important with food, which can make up a large amount of the weight you carry on a longer trip. Short trips are easy but planning what you feel like eating in two or three weeks time for an extended trip is hard. I know from my own experience that my food demands as well as tastes go in cycles. Now the one concept that is often left off the ultra light hiking debate is that of ‘relative weight’. And by this I mean that the weight of your gear will depend on the gear size, which is dependent on body size. My wife weights approximately 30% less than I do and is also shorter. If we carry identical pieces of equipment the different sizes that we use will mean different weights. When you consider that the definitions of ultralight and lightweight hikers are based purely on an arbitrary base weight then potentially it’s easier for my wife to be an ultralight hiker than it is for me. Now other considerations come into play here such as susceptibility to cold but you can see where I’m coming from. If you search the internet you will find recommendations for the maximum weight that an individual should carry usually represented as a percentage of their body weight. Over the years I have seen varying recommendations ranging between 20-30% as a maximum (30% is way to much for anybody unless your in the army and thats not about fun).This means that if my wife and I are carry identical weights as a starting point then for her to loose the same percentage of gear versus bodyweight she will need to drop more than I will. Now getting back to my hike I mentioned earlier on. In the two years that I have been working on reducing my base weight I use this same hike each time as an indicator for how my journey to becoming an ultralight hiker is progressing. My most recent trip saw my entire pack weight shift from the starting point two years ago of 19.5 kg down to 13.3 kg, a reduction of 6.2 kilos (13.6 pounds) or nearly a 32% reduction. So now I am carrying 14% of my bodyweight for most trips. For my wife who has also had a similar 32% pack weight reduction she is now carrying 16% of her bodyweight. While the amount of weight dropped is identical the percentages against body weight are not. This discrepancy in pack weight reduction is mainly attributable to our individual cold tolerances, which means that she carries warmer, and heavier gear than I do. The gear purchases that I have recently made, and intend to make over the coming year, will see that reduce even further. So while I may never reach the target base weight to be considered an ultralight hiker, particularly since I’m carrying approximately 1kg (2.2lbs) podcasting/blogging technology, I’ll come close. Having said that I’m increasing my comfort level on my hikes and reducing the impact on my aging body, which means that I’ll be able to hike the more complex hikes far into the future.